History has the tendency of being seen as static and frozen when we view it from a a later time. What happened is what happened, and nothing else could have happened because, again, at that point, it is set in stone. Once upon a time, however, history could have gone any number of ways, and much of the time, it’s the act of change and transition that help drive history through various eras. James Burke is one of my favorite historical authors, and I am a big fan of his ideas behind “Connected thought and events”, which makes the case that history is not a series of isolated events, but that events and discoveries coming from previous generations (an even eras) can give rise to new ideas and modes of thinking. In other words, change doesn’t happen in a vacuum, or in the mind of a single solitary genius. Instead it’s the actions and follow-on achievements by a variety of people throughout history that make certain changes in our world possible (from the weaving of silk to the personal computer, or the stirrup to the atomic bomb). “Connections" is the companion book to the classic BBC series first filmed in the late 70s, with additional series being created up into the 1990s. If you haven’t already seen the Connections series of programs, please do, they are highly entertaining and engaging (ETA: the first series, aired in 1978, is the best of the three). The original print edition of this book had been out of print for some time, but I was overjoyed to discover that there is a current, and updated, paperback version (as well as a Kindle edition) of this book. The kindle version is the one I am basing the review on. The subtitle of the book and series is "an Alternative View of Change”. 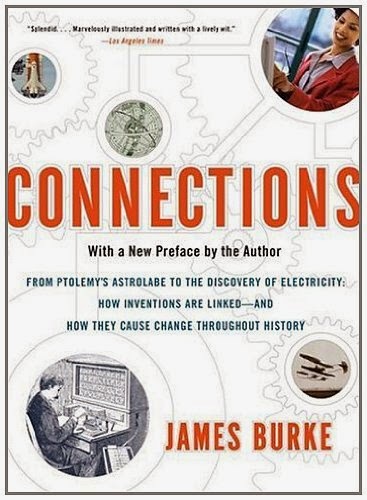 Rather than serendipitous forces coming together and “eureka” moments of discovery happening, Burke makes the case that, just as today, invention happens often as a market force determines the benefit and necessity of that invention, with adoption and use stemming from the both the practical and cultural needs of the community. From there, refinements and other markets often determine how ideas from one area can impact development of other areas. Disparate examples like finance, accounting, cartography, metallurgy, mechanics, water power and automation are not separate disciplines, but rely heavily on each other and the inter-connectedness of these disciplines over time. The book starts with an explanation of the Northeastern Blackout of 1965, as a away to draw attention to the fact that we live in a remarkably interdependent world today. We are not only the beneficiaries of technologies gifts, but in many ways, we are also at the mercy of them. Technology is wonderful, until it breaks down. At that point, many of the systems that we rely heavily on, when they stop working, can make our lives not just sub-optimal, but dangerous. Connections uses examples stretching all the way back to Roman Times and the ensuing “Dark Ages”. Burke contends that they were never “really dark”, and makes the case of communication being enabled through Bishop to Bishop Post to show that many of the institutions defined in Roman times continued on unabated. Life did became much more local when the over-seeing and overarching power of a huge government state had ended. The pace of change and the needs of change were not so paramount on this local scale, and thus, many of the engineering marvels of the Roman Empire were not so much “lost” (aqueducts and large scale paved roads) but that they just weren’t needed on the scale that the Romans used them. Still, even in the localized world of the early Middle Ages, change happened, and changes from one area often led to changes in other areas. This program changed the way I look at the world, and taught me to look at the causal movers as more than just single moments, or single people, but as a continuum that allows ideas to be connected to other ideas. Is Burke’s premise a certainty? No, but he make a very compelling case, and the connections from one era to another are certainly both credible and reasonable. There is a lot of detail thrown at the reader, and many of those details may seem tangential, but he always manages to come back and show how some arcane development in an isolated location, perhaps centuries ago, came to be a key component in out technologically advanced lives, and how it played a part in our current subordination to technology today. Regardless of the facts, figure and pictures (and there are indeed a lot of them), Connections is a wonderful ride. If you are as much of a fan of history as I am, then pretty much anything James Burke has written will prove to be worthwhile. Connections is his grand thesis, and it’s the concept that is most directly tied to him. This book shows very clearly why that is.